Is Banksy a vegetarian? The notorious UK street artist revealed the latest work in his “Better Out Than In” New York residency series this morning, and it certainly suggests that he is less than enthused about the meat industry. 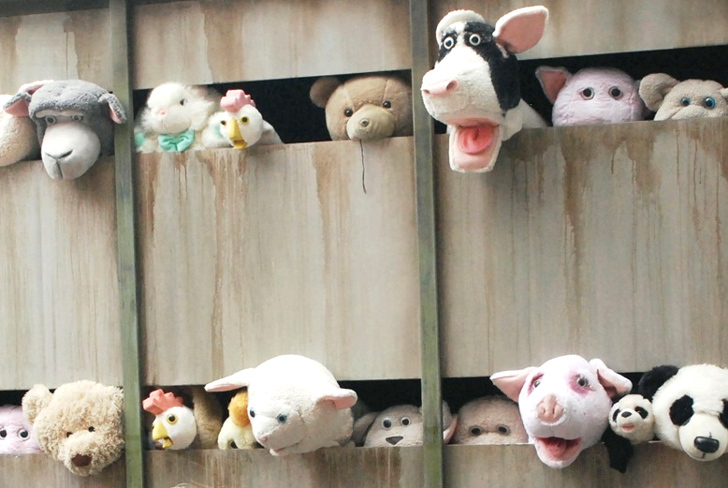 Entitled "The Sirens of the Lambs," the moving installation features a corral of shrieking, animatronic stuffed animals aboard a slaughterhouse delivery truck. According to the artist's Instagram, the hilariously horrific truck will fittingly be touring NYC's Meatpacking District before embarking on a citywide tour. Check out Bansky's video of the truck in action after the jump. While “The Sirens of the Lambs” is, at first glance, quite comedic, it also – in pure Banksy form – makes a social commentary about the horrors of the livestock industry. All types of animals (cows, pics, chickens, ducks, lambs and even a panda) can be seen protruding from the “Farm Fresh Meats” truck, presumably on the way to the slaughterhouse. Some of the creatures move their heads and “cry out” for help, attracting the attention of people on the street. In the video, the truck is also seen passing a meat market, where butchers look out at it with amused expressions. Children seen reacting to the installation in the video seem more delighted than upset by its deeper meaning, but one child at 0:45 is visibly upset by what he sees. What do you think about Banksy’s “Sirens of the Lambs”? Tell us in the comments below. The shot of the school children looking at the army green truck of toys makes me think of the loss of children's innocence as they face the cold harsh world. It can be a statement about war as well as extinction. A very interactive piece, so thank you Banksy. Banksy, thank you! Go vegan !!! I love it but the pandas are there why? If you aren't showing blood, I don't know who would "get it". While "The Sirens of the Lambs" is, at first glance, quite comedic, it also - in pure Banksy form - makes a social commentary about the horrors of the livestock industry. All types of animals (cows, pics, chickens, ducks, lambs and even a panda) can be seen protruding from the "Farm Fresh Meats" truck, presumably on the way to the slaughterhouse. Some of the creatures move their heads and "cry out" for help, attracting the attention of people on the street. In the video, the truck is also seen passing a meat market, where butchers look out at it with amused expressions. Children seen reacting to the installation in the video seem more delighted than upset by its deeper meaning, but one child at 0:45 is visibly upset by what he sees. What do you think about Banksy's "Sirens of the Lambs"? Tell us in the comments below.